Sight-reading – you know you love it……Three tips to have you sight-reading like a legend! I received an email this week from a reader looking for some help around improving their sight-reading on the classical guitar. So, I thought I’d share my thoughts on this with you too! Yay! Sight-reading can seem quite a scary prospect, particularly if you’re not used to it or not so confident with your written music. It can become less like Dante’s nine circles of hell, however, with a bit of work. (1) In the words of Arnold Schwarzenegger in Predator – Do it! The best way of getting better at sight-reading is to dive in and do it. And do lots of it. And then do some more!! And, dear reader, as you know one of my favourite things to say is consistency is key. Well, the same applies here. Take something such as the AMEB graded sight-reading book and set yourself a task of reading two or three pieces at sight each day. Start at a grade or level of piece you feel reasonably comfortable with sight-reading and then up the ante slowly once you feel you’re comfortable sight-reading at that particular level. And it matters not if you start around Grade One, or lower even, what does matter is doing it. By doing lots of it, it will seem a heck of a lot less scary too. Whilst you’re building up your awesome Ferrari-like sight-reading skills, the most important thing when sight-reading is keeping going. Even if you’re playing completely the wrong notes, keep going! Play with good musical intention and feeling and a sense of pulse and that’s half the battle. 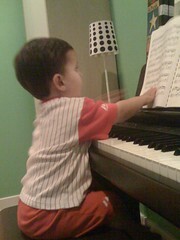 Some theory study in addition to sight-reading practice will truly pay dividends. Yes, I appreciate that the thought of doing theory study sounds incredibly dull and about as inviting as a dry cracker topped with a layer of Saharan sand, but some regular study, perhaps working up through one of the many graded workbooks out there, means you’re ingraining the keys, scales, harmonies, and other patterns that are the building blocks of music. By ingraining it, it becomes second nature. This means there’s not so much to actively think about all at the same time when you’re sight-reading. It can take care of itself to a point and leaving you freer to think about the music making. Which is what we all want, isn’t it?! Next postFeel the Fear – Addressing Performance Anxiety – What are you most afraid of?